211 Bernard: TONIGHT!! Secondhand Prom and Launch Party for the WORN Archive! TONIGHT!! 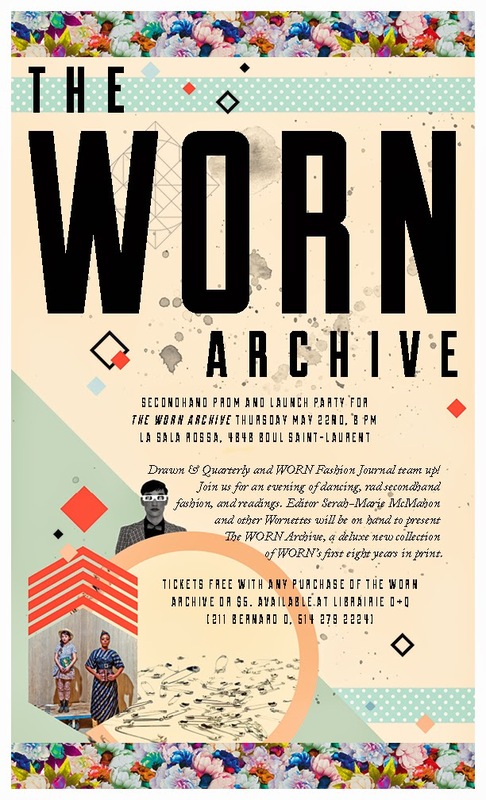 Secondhand Prom and Launch Party for the WORN Archive! Drawn & Quarterly and WORN Fashion Journal are teaming up! We are excited to invite you to the Secondhand Prom and Launch Party for the new and beautiful WORN Archive (Drawn & Quarterly)! Join us TONIGHT at La Sala Rossa (4848 boul. St-Laurent) at 8pm for this special event! You can expect an evening of dancing, rad secondhand fashion, and readings. Editor Serah-Marie McMahon and other Wornettes will be on hand to present The WORN Archive, a deluxe new collection of WORN's first eight years in print. Prom-dance to the vintage pop, soul, and new wave vinyl of DJ Teddy the K.
Tickets $5 (worth $5 off The WORN Archive) or free with any purchase of the book. On sale now at Librairie D+Q. We're so excited to be collaborating with WORN! Their magazine is a consistent bestseller at the store and we can't wait to celebrate their work. Check out Marcela's post for more about The WORN Archive - out now!